Home » Food Processors & Mixers » Stand Mixers » What Are the Best Kitchenaid Mixer Attachments? KitchenAid makes some kitchen gadgets that many home cooks droll over. While they may not be for those who just do a little basic cooking, they are definitely sought after by avid cooks. One such KitchenAid appliance is the stand mixer. They come in various models and range in price, but they’re not only meant for mixing ingredients together. You can buy optional attachments that use the power of the mixer to do several other jobs that you would otherwise either do manually by hand or by a separate appliance. If you’re here to ask “what are the best KitchenAid mixer attachments to buy”, we’ll help you get your money’s worth by selecting a few that should be ranked at the top based on what they can do and how much time and effort you save by using them. Just to be clear, these differ from the accessories for kitchenaid mixers, like different types of mixer bowls, hooks and beaters. Attachments are what work in place of stand mixer hooks and beaters to do completely different jobs. Here are six of the best attachments for a Kitchenaid mixer, but if you’d like to go through all available ones, Amazon is where you’ll find them. Note: All these attachments are compatible with any Kitchenaid model of stand mixers. The KitchenAid Fruit & Vegetable Strainer and Grinder Set attaches to the mixer’s power hub and allows you to grind, puree and strain a wide variety of fruits and veggies and you can even grind meat with it. The grinder works on the same exact principle as a regular meat grinder, where you feed pieces of food into a hopper on top and grinding plates break down the food. With this attachment, you also get a strainer that you attach to the end of the grinder to strain out unwanted parts of fruits and vegetables so you don’t have to peel or de-seed your produce first, only cut them up and remove large pits if necessary. Tough veggies do need to be cooked before straining. The two grinder plates are made of stainless steel and have coarse and fine teeth. In addition to fruits and veggies, you can use it to make ground meat for burgers, make breadcrumbs and grate hard cheeses. The strainer will allow you to separate seeds, skin and rind, and you’ll get a thick puree when doing so, perfect for making sauces, chutneys and jams. You can make a good quantity of baby food and freeze it in batches. It is so effective that you will have to clean the strainer often, but better to clean it than to let bits and pieces of unwanted material to get through. All the parts can be put together and taken apart easily without the use of tools. You may not need to get a separate food processor unit when you own a KitchenAid mixer. Simply fix the KSM2FPA Food Processor Attachment to the front power hub, and you are good to go. This is a great time saver when you to do a lot of chopping, slicing and dicing for more than a few people. This full function food processor attachment for Kitchenaid stand mixer comes with 4 discs that allow you to slice, shred and julienne, and you can even dice 8 mm cubes of cheese, fruit and other harder fruits and vegetables. The slicing thickness can be adjusted too using a lever. It is dishwasher safe, so cleaning it up is a snap, and it comes with a separate storage case, so that you’ll never lose track of any of the cutting discs. If you’d prefer a dedicated food processor, we have recommendations for that too! If you like to make your own pasta, there is no need to get another gadget like a dedicated pasta maker when you have a pasta attachment for the Kitchenaid Mixer. The KPEX Pasta Excellence Set comes with 6 different attachments, so you’ll be able to make just about any type of pasta that you can imagine. 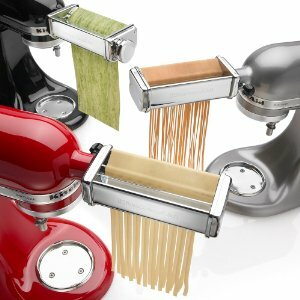 The set includes the pasta roller, cappellini cutter, lasagnette cutter, fettuccine cutter, spaghetti cutter and ravioli maker. You first use the pasta roller to make flat sheets of pasta and you can adjust the thickness level to whatever you want. Then you switch it to one of the cutters to make your preferred type of flat pasta. Be aware that the ravioli maker takes a bit of patience with trial and error to get the ravioli right. You have to fill the feeder tray on top and it will be fed into the pasta sheet as you guide it into the ravioli maker. Each attachment is all-metal construction for exceptional durability, and although this is not an inexpensive attachment kit, it is one of the finest pasta makers on the market, bar none. You also get a scoop for the ravioli filling, and a cleaning brush that is best used once the bits of dough left in the cutters have dried up. If you think you’d prefer a dedicated pasta maker of the roller/cutter or shaped pasta type, we have some recommendations for you. There are two types of juicers. Centrifugal types and masticating types. Centrifugal types work better with juicy softer fruits, while masticating types work better with harder fruits and vegetables. The latter is a fairly expensive gadget and is only worthwhile to dedicated juice enthusiasts. To know more about masticating juicers and which ones are best in the market, we have our recommendations. However, if you want to juice efficiently without spending too much on the appliance, a juicer attachment for your kitchenaid mixer is the answer. The KitchenAid Masticating Juicer and Sauce Attachment will get the most juice out of many harder fruits and veggies, and there is even a wheatgrass recipe, which is one of the harder veggies to juice. That’s not to say it won’t extract juice from softer fruits and veggies like tomatoes, pineapples, and berries. It certainly will, but it’s true calling is harder produce. You can also use it to make sauces, jams and chutneys. This attachment comes with 3 pulp screens, so you can have a little or a lot of pulp. The extra wide feeder tube lets you put larger chunks inside, but as with all juicers, the smaller the pieces the better the juice extraction will be. It comes with a cleaning brush and all parts are dishwashable. This is not a great citrus juicer, however, you can get an optional citrus juice attachment that separately attaches to the power hub. However, a separate citrus juicer is inexpensive and doesn’t take up much space. Making preservative-free ice cream at home is great if you have many dessert fans to feed. The KitchenAid KAICA Ice Cream Maker is the only attachment on this list that does not use the power hub. It actually attaches to the mixer blade holder, and the “dasher,” as it is called, will churn ice cream ingredients to the consistency that you want. This is the freezer bowl type of ice cream maker, which we describe in our article about best ice cream makers available for the home. The freezer bowl, which rests on the bowl stand beneath the mixer, will need to be frozen for at least 24 hours before use, but once ready, just add ingredients, attach the dasher to the mixer and let the KitchenAid do all of the work. You can make up to 2-quarts of soft serve ice cream, gelato or sorbet at one time, and it will be ready in about 20 to 30 minutes. You’ll be able to can make virtually any type, flavor or consistency of ice cream that you can dream of, and experimenting with different flavors and additives, like nuts, berries, chocolate chunks and others, are all part of the fun. Note: The KAICA model fits only the KSM6573C and KSM7 stand mixers, while the KICA0WH model fits all the other mixers. For those of you who want the freshest and most nutrient rich grains for cooking or baking, the KitchenAid KGM Stand-Mixer Grain Mill Attachment will grind up virtually any type of grain you feed into it. It will do up to 10 cups at a time so you can buy a batch of whole grains, do bulk grinding and store in batches for later use. It’s all metal, so it will be very durable, and it will grind such things as wheat, oats, corn, rice, and other low-moisture, low-oil grains. You can select whether you want it just cracked, a very fine consistency, or anything in between, they are all possible with this unit. Just remember, non-oily means you can’t grind coffee beans or peanuts, to name a couple, so if you are looking for that type of mill, this one won’t give you that option. The included brush should be used to clean the parts when you’re done. Otherwise they can be washed by hand.